Dear Apple please fix this iPhone problem.. I acquired the iPhone 3G on launch day in the UK. This week I was lost in a part of London’s West-End and the fantastic Maps function saved the day for me, pinpointing exactly where I was and showing me where I needed to go, great work. And then I needed to call one of my clients..
Then the trouble started…you see dear Apple I have adult man hands…Do the team working on the iPhone contact search have little elf sized fingers? 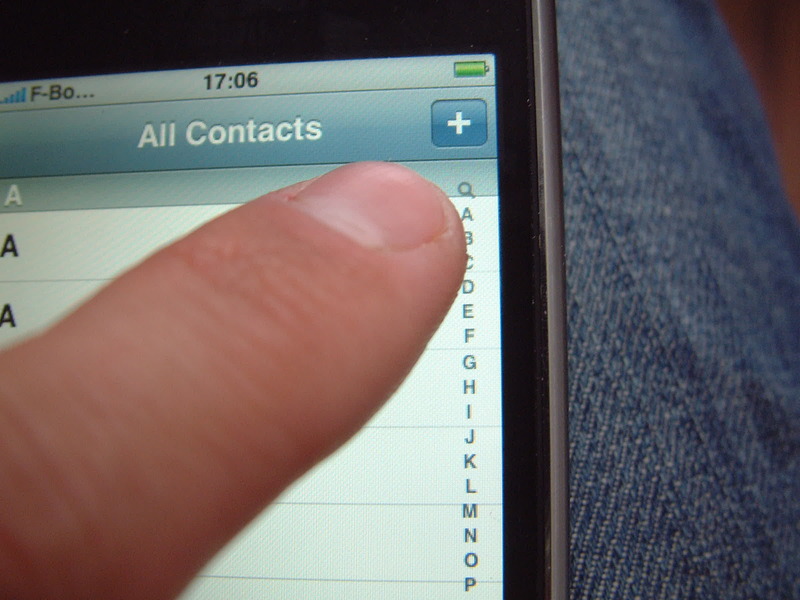 I simply cannot easily find a contact, those letters are too small to locate any particular letter – oh thanks for the magnifying glass search function, the only problem is, the icon is too small to locate with my “man hands”. If there is any easier way to search, please let me know, i’d be grateful, alternatively why not simply have a permanent search bar at the top, then us people with “man hands” can actually find the people we want to call..
Typing with the iPhone 3G? Is that really your finger or did you employ a hand-double? Seriously though, if you will have these swanky toys you have to put up with these things… nay I suggest you grow the nail of your right index finger and file it into a stylus shape? Ah…perhaps some kind of plastic surgery…? Surgery is an option; you can get 1/3 of your fingertip shaved off… You’d be the Tony Iommi of the iPhone! OK, maybe the Ronnie Lott of smartphones?